APPLICATIONS: The AES Safety Gator Mobile Fall Protection system is designed for steep slopes and residential roofing and provides a multi-person anchorage point and fall arrest system. Enables compliance with OSHA 1926.502.D. 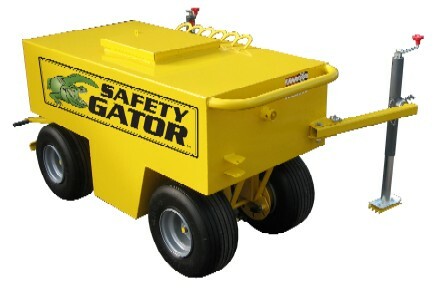 The Safety Gator may be used where worker mobility and fall protection are required. The Safety Gator is used as a part of a complete mobile fall protection system which include a full body harness, lifeline, self-retracting lifelines and lanyards. Safety Gator allows up to 6 workers to be tied off at the same time while using the Anchor Cart for Fall Restraint or for Fall Arrest. PRODUCT OPTIONS: Extra Roof-top Safety Guide (one included). PRODUCT WARRANTY: One year manufacturers warranty. 5/8 INCH X 100 FT. VERTICAL LIFELINE POLYESTER ROPE WITH LOCKING SNAP-HOOK AND TAPED TRAILING END. MEETS OSHA 1926 AND ANSI Z359.2007. PRICE/EACH. 5/8 INCH X 100 FT. VERTICAL LIFELINE POLYESTER ROPE WITH LOCKING SNAP-HOOKS ON BOTH ENDS. MEETS ANSI Z359.2007. PRICE/EACH.